And so we return our attentions to Manchester, and the third of the workshops I attended: “Puzzling out the Picture“, taught by Veronica Lawlor, from New York. This was focused on composing your sketches using directions to move us into and out of the image, to see the picture as “a dimensional space in your mind”, that has six sides. 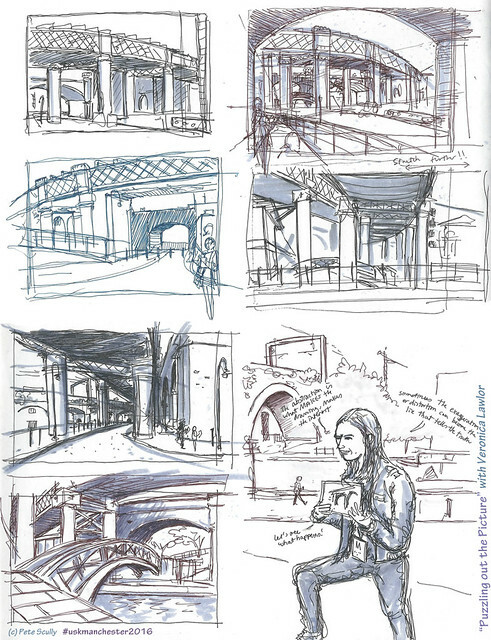 We went down to Catslefield, an area of Manchester I didn’t know much about, but was truly an urban sketchers dream – bridges and canals going in every direction, the perfect space for this sort of exercise. Veronica asked us to move about the space and draw quick thumbnails of the different views we encountered, encouraging us to identify how the eye moves into and around the space. Mine are above; this was a really enjoyable exercise. Above, Veronica explains the idea. We were then asked to choose a scene from our thumbnails and draw it larger and in more detail. The rain was not heavy, but constant and drizzly – hello Manchester, hi English summer, how I’ve missed thee – and also kind of moving sideways making any cover a bit useless, but we all persisted. 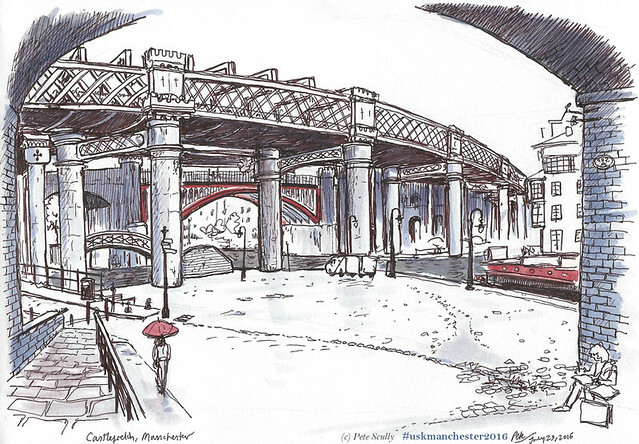 I stood beneath a big archway beneath a bridge and drew the scene below. Notice the little iron castle turrets on the railway bridge, a nice touch! Manchester was where the Industrial Revolution was really born, the city is a child of that booming period, and Castlefield really takes you back into that history. It was here that the world’s first industrial canal, the Bridgewater Canal (1764), terminated, and here was also the terminus of the world’s very first passenger railway line, at Liverpool Road station, in 1830. History doesn’t begin with the Industrial Revolution however – nearby was the Roman fort of Mamucium, or Mancunium, which gave Manchester its name (English town and cities with the suffix -chester or -caster generally have origins as Roman forts). I sketched in the usual brown-black pen, but used some grey markers to add a bit of tone, as well as a touch of red. Now I probably would have done a bit more detail or added a bit more colour, but, well, Chips in Gravy. I remembered that there was a chip shop around the corner from here (I passed it while lost the previous evening, looking for the Peveril) and just had a huge craving for chips in gravy. This is more common in the north of England than in the south, and I absolutely love it. Now it’s not quite the same as poutine – there is no cheese – this is just what you can get at any chippy up north and it drives me mad to even think about it, it’s so good. I used to eat it in Scarborough when I’d go up there years ago. Now, it rained a lot during this workshop, so it was good to take a break from the sketch and go and grab some chips in gravy, and sit in the drizzle, with an orange Tango. Totally a “back in England” moment for me. Then, it was back to the sketching. Despite the rain (which nobody really minded much), this was an extremely enjoyable workshop. Veronica teaches with a lot of enthusiasm and has a very encouraging manner, and her own work is so alive that it was a real pleasure to learn from her. 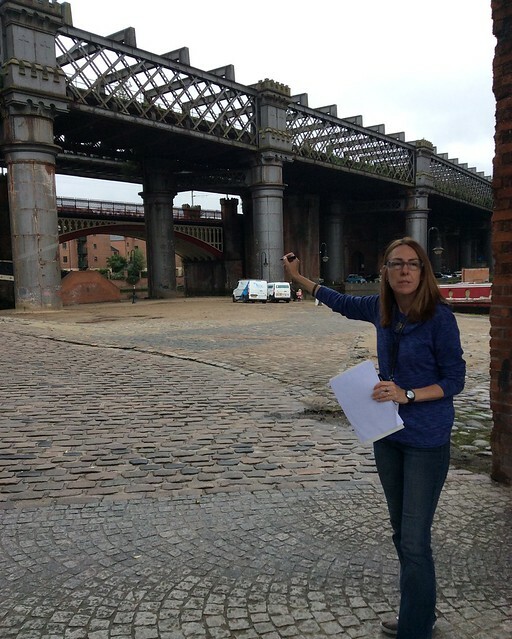 She joked that it would be nice to come back and sketch Castlefield in the summertime! Many thanks to Veronica for a fun workshop! Check out her work at www.veronicalawlor.com, and also her books, particularly “One Drawing A Day“, and “Reportage and Documentary Drawing“, part of the Urban Sketching Handbook series. I like the way your chosen shelter has become a frame for the scene you chose to draw. I just about short-circuited my keyboard from the drool I was producing looking at your chips and gravy. Man, I miss proper chippy chips and the array of sauces and gravies for lashing on them. Drooooool. Believe, it was heaven. 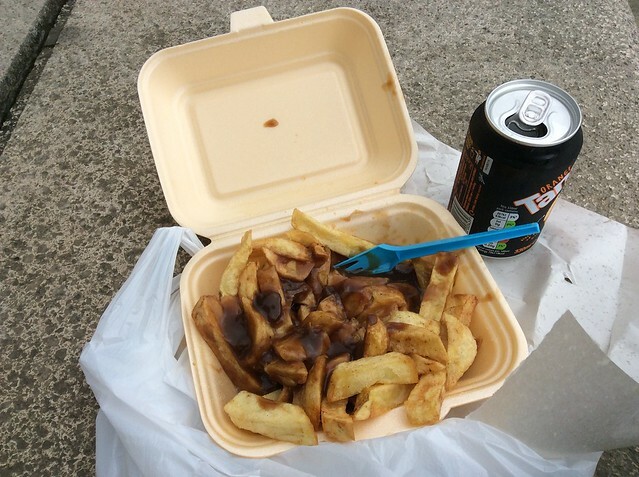 Nothing like chips in gravy eaten in the rain.